Our AGM is a great opportunity to welcome members and guests, to reflect on achievements of the past year, note Board appointments, present our accounts, celebrate staff excellence in the presentation of our annual staff awards and hear from guest speakers on pertinent sector topics. Our President Mary Verschuer spoke about the change that has occurred during 2017. She acknowledged the contributions of Lynn Farrell, Catherine Hunter and Joan Wilson, and Board Directors Leah Fricke and Denise Taylor who left the organisation in 2017. 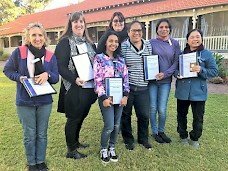 She welcomed Marlene Shepherd and Janice Francis to the Leadership team, and thanked Mariam Christodoulos for stepping up to support the organisation during this time of transition. Mary farewelled Carolyn Swindell who is leaving the Board, and officially welcomed Dr Peter Hendy, Hilary Johnston-Croke and Sarah Michael who have joined the Board. Mary also spoke of the year to come with our focus on our new Strategic Plan and her confidence in and admiration of the staff at The Infants’ Home. Lindsay Smartt, our Treasurer, discussed the 2017 financial report. Service Awards and Staff Excellence Awards were also presented, an opportunity to formally recognise those who go above and beyond in their contribution to The Infants’ Home and the community we serve. Guest Speaker: beyondblue ambassador Kirsten Hanson. Simone Hayes, Allied Health Director, introduced our special guest speaker Kirsten Hanson. Kirsten spoke about her battle with depression and anxiety following the birth of her children, and the debilitating affect it had on her. Her story highlighted the internal struggle she faced and its impact on her relationship with her baby and those around her. She spoke of the strategies she continues to deploy to overcome these challenges and live a joyful life. 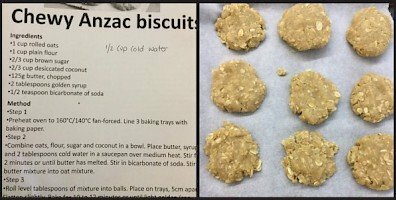 Kirsten’s aim is to raise awareness about depression and anxiety and reduce the stigma attached to mental health. Children at Johnson House Toddlers have been investigating what Ladybirds look like. The children discussed the features of a ladybird and discovered that they have 6 legs, and wings that allow them to fly. The children discovered that the ladybird has wings like a butterfly. Following the discussion, children shared the story The Bad Tempered Ladybird. After the story, the children drew a ladybird and discovered that a ladybird is red and black and has black spots. The children in Johnson House Preschool and Toddlers participated in National Simultaneous Storytime on Wednesday 23rd May at 11am. The children had the opportunity to gather together to read this book, helping to expand their literacy skills including listening and exploration of images and text. National Simultaneous Storytime is held annually by the Australian Library and Information Association. Its aims is to encourage more young Australians to read and enjoy books. Every year a picture book, written and illustrated by an Australian author and illustrator, is read simultaneously in libraries, schools, pre-schools, childcare centres, family homes, bookshops and many other places around the country. 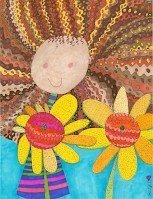 Mat time is planned to focus and develop children’s language skills in a small group setting. During mat time, children engage in singing and reading and are encouraged to participate in simple games. A variety of resources are used during mat time including visual cards and sign language to support children to understand meaning. Murray house children are showing familiarity with the mat time routine as they revisit the area and have many things to share, listen and talk about. Mat time helps the children to develop language skills, but they are also learning to take turns and develop social skills. Children at Gorton House toddlers enjoyed group time with Uncle Terry, learning about culture and practicing two songs (Sasha and Jalma). Some of the children knew the words and sang with Uncle Terry and the educators, performing hand actions. Children learned about Australian animals like kangaroos, koalas and Emus, pretending to be one of them while dancing. Uncle Terry showed them a special musical instrument – tapping sticks – and children sang songs while he tapped the sticks, before exploring them. Children were happy to share the space with their peers and take turns to tap the sticks. Children at Rigby House have been learning how to use the recycling bins, learning that blue is for cardboard and paper, red for general waste and yellow for plastic. Sustainability education enables educators and children to promote a sense of responsibility, show respect for the natural environment, be active participants and bring about inquiry and social change. Yumi Wong-Pan is a parent of two children. Caleb is at Robinson House, and Micah is at Rigby House. Caleb has a rare disease called William’s syndrome. Recently, Yumi decided to make a generous donation of some posters and books to the integration team of The Infants’ Home (consisting of Directors, educators, occupational therapists, speech pathologists and an early childhood nurse) to help raise awareness of William’s syndrome and to support the team in their role of providing early education and care for Caleb. Katie, an educator at Robinson House, had observed that children were showing interest in hiding under furniture or moving it around to build a cubby house. Katie facilitated the children’s play by suggesting some ideas and encouraging them to use their imagination. Working together, Katie and the children constructed a cubby house using a long piece of fabric from Robinson House, a sheet brought in from a child’s home, a tall wooden cupboard and some tyres with a tray placed on top. Once the cubby house was finished, the children climbed underneath the material to hide, laughing and talking amongst themselves. Children at The Secret Garden Family Day Care in Avalon enjoyed going on a Teddy Bear’s Picnic. 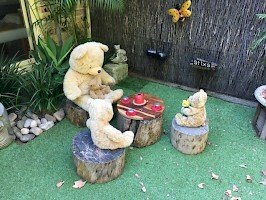 This beautiful learning environment extended the children’s interest in cooking and feeding the teddy bears by enabling them to explore and engage with social environments through relationships and play. 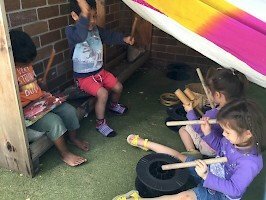 At Julie and Greta’s Family Day Care in Warriewood, Julie set up a maths activity for the children that encouraged them to match shapes and explore shape recognition and hand/eye coordination. The children accepted challenges and recognised their achievements as they worked their way through the shape board.